Well, I thought I begin with the first post in the new year with this slightly larger piece that I finished recently, maybe it will decide the direction of my upcoming work, onto a fresh start on the easel in 2009, Happy New Year! 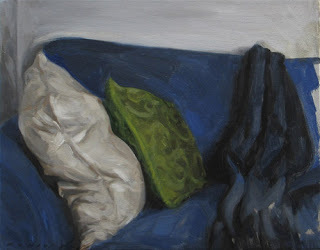 2 Responses to "Pillows – Art interior painting in oil by California artist"
A very nice fresh start indeed. Just found your site- all of your work is great- this piece shows some great realism.